Our graphical blue CV template includes some stylish elements that are ideal for job applications which require a creative flair. 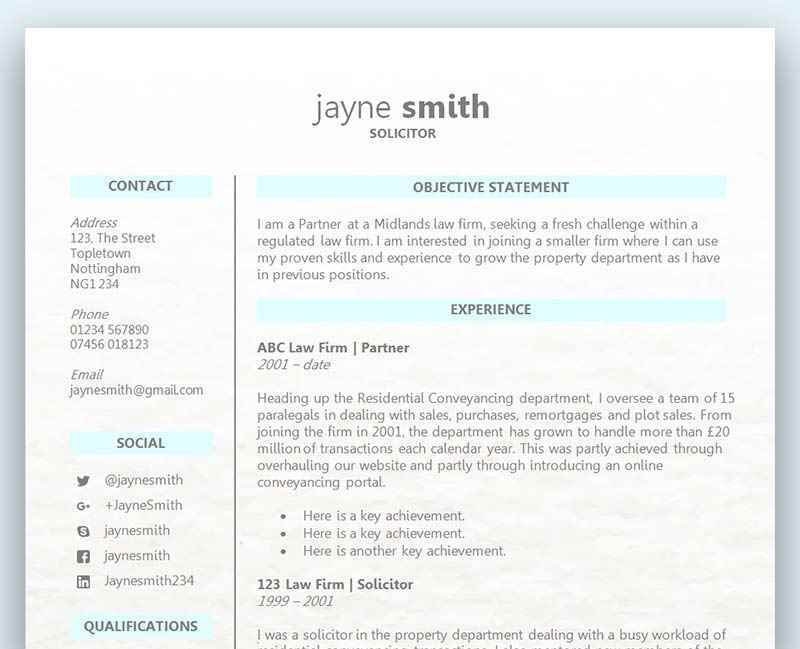 Designers and marketers alike will love the layout of this smart CV which can be fully customised in Microsoft Word. You'll also need the Impact font for this CV to display properly (download link below). One page creative CV template with titles in a narrow left column	Overall rating:	3.3	out of 5 based on 3	reviews. Sometimes you need to show a little flair with your job application and this attractive blue-themed CV helps you do just that. Making use of the Impact font, it's a stylish CV that allows you to present your information in a smart, uncluttered way. Most of us know what to include in a CV and how to structure one, however it’s sometimes not clear what shouldn’t go on a CV. There are times when a CV can look a little padded and doesn’t get straight to the point. A focused CV stands a far greater chance of landing an interview than one which hasn’t taken into consideration the type of role and industry being applied to. You may often hear that it’s a bad idea to list past jobs that aren’t relevant to the new role you are applying for, however you have to be very careful with this as you don’t want to create any employment gaps which may put off the employer. Instead, our advice would be to limit the information you provide for certain jobs that don’t bear any relevance to the new role, and/or don’t have any transferable skills. You do however have to be very careful not to omit a previous job by assuming that just because it was in a completely different industry, it has no bearing for the future. If the new job relies heavily on communication and selling skills, then even your job as a waiter may be worth elaborating on if you don’t have many other examples. However, if you’ve had other roles after this that are far better to showcase these skills, then it may not be important to list lots of tasks and responsibilities as a waiter (if any at all). Your main focus is to highlight and elaborate on all of the relevant past roles to ensure the recruiter easily notices that you are perfectly suited for the job. There is no need to create a huge long list for every single role you’ve ever had when the hiring manager is only interested in what will benefit their company. A common mistake a job seeker makes is to spill over to three pages with their huge list of tasks and responsibilities for each role. You should always try to keep your CV to a strict two pages in length, otherwise you may bore the reader with too much information. Check back over your CV once it’s written and see how much value each section is adding to your overall application. There will always be something on your CV which doesn’t directly help the employer, but that doesn’t mean to say you can’t focus your CV on the overall task at hand – ticking as many boxes as you can! Here’s a great article you might like to read on how to demonstrate my previous performance. There is no need to include certain personal information on your CV like marital status, religious beliefs, your age, and so on. None of this information is important to how well you can perform in the role, and there is no point in allowing yourself to be judged before you even get a chance for an interview. We’d like to think we live in a world without judgement or discrimination. Unfortunately there are still cases of this, and it is also hard to ever know if you were rejected based on this personal information. So to avoid any chance of this happening it is best to only include your name and contact details. Highlight your name in a larger and bolder font at the top of the page, which will essentially add your name as the title of your CV. You can also include your specialisation in a larger font just below or next to your name. For example – Solicitor, General Manager, IT Specialist, and so on. You may feel like embellishing certain facts about your skills and experience is a better way to get a job interview – and this may be true. However, it’s something we strongly advise against. There are lots of ways this can go wrong and you can be easily caught out at any stage of the process. Possibly from the recruiter reading the CV or during the interview. The most common way for an employer to realise that you embellished your CV is when you actually start working for them. If you are not capable of performing as well as you claimed on your CV, then you are of course going to come up short in the role. It also obviously goes without saying that blatant lies on your CV is going to cause even more problems for your employer as well as yourself. It’s one thing to embellish information, but to actually lie about any aspects of your skills, experience or qualifications is just unfair to all involved. If you feel like you’re struggling to get as many interviews as you deserve, please read our Ultimate top ten tips on how to write a CV.